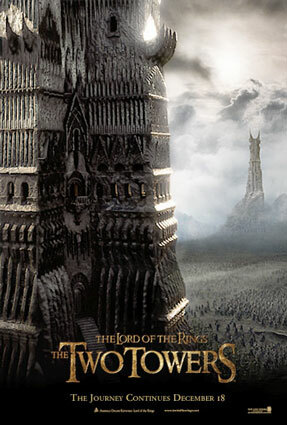 An outstanding second installment in what is proving to be one of the most impressive feats in film history, THE TWO TOWERS just oozes EPIC out of every one of its cinematic pores. It is movie making on a MONUMENTAL scale but the best part about it is that the humanity does not get lost in all that GRANDNESS. For every HUGE scene there is an equivalent small character scene that makes you smile or cry or think. The film immediately takes up the story where FELLOWSHIP ended it - Frodo and Sam are on their way to Mordor while Merry and Pippin are in the clutches of the Urukai with Aragorn, Legolas and Gimli following closely behind in a determined effort to save the two. The story fragments into three separate but related ones. Frodo and Sam are joined by the creature Gollum who, driven insane by the ring, covets it above all else. Wanting to be near his "precious", Gollum will agree to guide the two hobbits to the gates of Mordor beyond which lies Sauron, Mount Doom and Frodo's destiny. Merry and Pippin will find themselves in the mysterious Fangorn Forest where they'll try to enlist the aid of the tree-like Ent race while Aragorn, Legolas and Gimli will reunite with an old friend and take a stand with the besieged people of Rohan against the forces of the Wizard Saruman. The last hour of this film delivers some of the most massive battle scenes EVER put on film with equal doses of emotion and edge of your seat daring do's. My favorite scene in the movie is an INCREDIBLE moment when just as all seems hopeless, the Elves march into Helm's Deep ready to stand with their human allies. I found myself all choked up by the utter relief, the sense of hope and comradeship this moment evoked. I came out of the film already wanting to see it again just so I could see this scene again. I'm convinced the Elves will end up leaving Earth after it's all over, going to Vulcan and returning eons later to befriends humans again when we head off into the stars. They are just TOO cool. I especially want someone on the TWO TOWERS extended DVD we'll no doubt get sometime in 2003 to explain how they got Legolas to do that WILD flip onto a horse. Amazing. My second favorite scene has to be when Aragorn, Legolas, Gimli and Gandalf are going to go see Theoden. The king's soldiers ask them to remove their weapons and they all do except Gandalf who asks the captain not to take an old man's staff and then proceeds ahead holding on to Legolas for support! It is particularly amusing considering that the Gandalf we get in TWO TOWERS is MUCH more powerful than his previous incarnation. Dressed now completely in white with matching white beard and hair Gandalf seems to have made a transitions of sorts. It's almost as if wizards go through levels like Karate students do - he was gray before but now he's gotten his "white belt" and is VERY much Saruman's equal. While on their travels, Frodo and Sam end up getting captured by band of men from Gondor, headed by a young captain named Faramir who they soon learn is the brother of Borromir - the warrior who surrendered his life at the end of FELLOWSHIP to try to save Merry and Pippin. I don't think they could have picked someone who looked more like Sean Bean (Borromir) if they had REALLY used blood relative of his. Great casting there. The Ents with Merry and Pippin - loved them. The scenes with them in the forrest are somewhat frustrating juxtaposed as they are with the battle scenes and Frodo and Sam's journey but frustration is PRECISELY what we're supposed to feel. In all the other scenes and all the other stories playing out there is a tremendous sense of urgency. Meanwhile Merry and Pippin are with these tree creatures that COULD be good allies...and yet it's taking them forever to do anything. The movie makers did a very clever thing in making Gollum's eyes resemble Frodo's. They're a visual reminder that at one point Gollum was, if not a hobbit, a similar creature - perhaps just as good natured and full of life as the hobbits. The scenes in which Gollum is arguing with his dark side are funny - but sad too. Elijah once again does a great job with Frodo. That guy has one of the most expressive pair of eyes I've ever seen. You can see the toll the ring is taking on him. You can see the compassion he feels for Gollum and the fear in knowing that in the creature he may be looking at his future. TWO TOWERS is one incredibly entertaining movie that's going to make the year ahead seem LONG as we wait for that final installment in what will likely end up becoming THE film masterpiece of our times. One small piece of advice - take SMALL sips of your drink early on. It's 3 hrs. long. You do NOT want to miss a second of this movie.